Should I eat organic ? Now that I’m over halfway through my third year of Naturopathic Medicine, I find more and more friends and family coming to me for medical advice. I absolutely love helping people, but since I cannot technically ‘treat’ anybody at this time, I always suggest some overarching lifestyle principles and refer them to an ND in their area. When I reflect on what people approach me about the most, the #2 most frequent question I get is “should I eat organic?" In case you’re curious, the #1 is “Does that mean you’re anti-vaccine because you’re going to be a Naturopath?” (FYI the answer is no, but I’m not here to spark a debate over a blog post). So back to question #2, I find this hard because the correct answer is both yes and no depending on your individual situation. In an ideal world, everyone would be eating organic because organic would be the only option. Unfortunately, the explosion of agriculture, GMO seeds, monocropping, and our society’s demand for cheap produce and meat/dairy products means this is no longer the case. Cow don’t graze peacefully grassy fields like they do on the front of burger packages. Instead, they are confined to extremely cramped spaces, pumped full of antibiotics and growth hormones, and fed a steady diet of corn to fatten them up. The Canadian Beef grading system is partially based on how much marbling there is in the meat (the more marbling=more fat=higher grade), it’s to their advantage to produce fatter cows. Back to the original question, when is the answer no? Let’s say I had a patient who eats absolutely no fruits and vegetables (orange juice does NOT count) and is on a very limited budget. At this point, all I simply want the patient to add fruits and veggies into their diet, I couldn’t care less whether or not that apple is heirloom, non-GMO, organic, local or whatever you may have, just eat the apple! There are so many important nutrients and antioxidants in fruits and vegetables, I would be happy if the patient reported they tried a piece of fruit for lunch and some veggies with dinner. Especially when there are financial constraints, the focus should be on eating whole, unprocessed foods; having to shell out more money for organic food can be very stressful, doing more harm than good. In this case, make sure you wash your fruits and vegetables thoroughly to get rid of pesticide residues and consider using a fruit and veggie wash that can be purchased at any health food store. When is the answer yes then? If the patient is willing and able to pay the price for organics, and interested in pursuing a cleaner lifestyle, then I would educate them on which fruits and vegetables should be purchased from the organic section. Different fruits and vegetables have varying amounts of pesticides based on how they are grown and how thick/thin their skin is. I use the Environmental Working Group (EWG) list of Clean Fifteen and Dirty Dozen as a guidelies. A complete list can be found here and outlines the fruits and vegetables worth the extra money and ones you can save on. But what about meat? In my opinion, if you had to choose, I would say spend your money on organic meat, not organic produce. Antibiotics in conventional meat has been linked to reduced effectiveness of antibiotics in children, and anyone who is looking to conceive should consider avoiding conventional meats to reduce exposure to exogenous hormones and xenoestrogens. 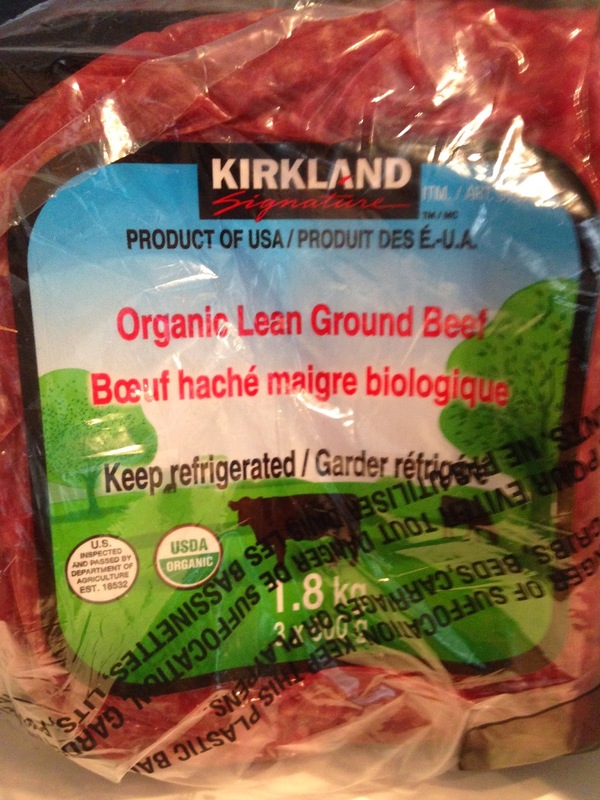 I buy most of my organic meat at Costco because it is well priced and readily available. Does this mean I eat 100% organic? Absolutely not! Although I strive to maintain a very healthy lifestyle, it is unrealistic to think you can eat everything organic, or feel like you have to be ‘perfect’ with your diet. 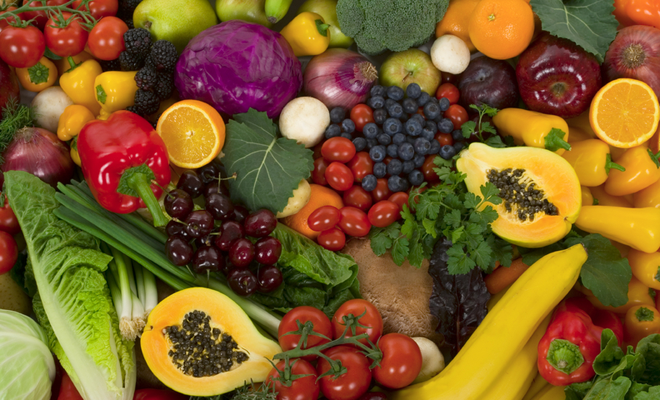 Instead, aim to eat 7-10 servings of fruits and vegetables a day, small amounts of organic meat, and if you can afford it, purchase the “Dirty Dozen” in the organic produce section. As always, PM on Facebook if you have additional questions and follow my Twitter, @lauravonhagen, and Instagram account, Laura von Hagen, for more great health tips and recipe ideas. Stay tuned for my Professional Facebook and website, both will be launching in May 2016! After surviving a week of midterms and too many assignments to count, my arms felt like they were going to fall off and the idea of writing a blog post was the last thing I wanted to do. Luckily my incredible intern at our school clinic was able to fix my sore arm with a couple acupuncture needles, so it was back to the writing for me! I follow a couple blogs and Facebook groups regularly, and lately there were several articles that caught my eye and resonated with me on multiple levels. I felt these would be great articles to share on a Thursday Link Love and expose my readers to some of these posts. 14 Healthier (and vegan friendly!) Halloween treats you can enjoy from the comfort of your home. Elana is an incredible blogger who tests and re-tests all of her recipes before posting. Lately, I noticed she adding dairy in a lot of her recipes, which was strange as she just wrote a Paleo cookbook. After reading this post, I understand why she made the change after listening to her body and allowing it the foods it needs to stay healthy. For her, grains and sugars are a no, but physically and emotionally dairy agrees with her body and prevents her from feeling deprived. This is why I HATE diets that restrict food groups and have ridiculous rules that everyone must follow. I’d much rather my future patients experiment and find out what foods they are sensitive too. For example, almonds may be super healthy, but maybe this, not gluten, could be source of all their digestive stress. Forcing someone to give up bread when they don’t need to will only cause more harm and daily stress than good. I encourage everyone explore what food they are sensitive and listen to their body when’s its talking. I chose this blog post because I love how Megan so eloquently combined a delicious looking treat with a rant about perfectionism. It’s easy to fall into a trap of eating junk food, it’s also easy to fall into a trap with being too perfect with the food you eat. I like her advice on accepting yourself, and not getting down when slips happen, because hey we’re all human and nobody’s perfect!!! I saved the most nerdy but coolest link in my opinion for last. This research paper looked at how qualities of highly processed junk food such as consumption at a high dose (who only eats one cookie or potato chip??) and rapid rate of absorption mimics that of highly addictive drugs. This study further validates the idea that junk food is addictive, and can be thought of like a drug, where users feel better after getting their high (insert bag of chips) before the inevitable crash (blood sugar drops) and then the searching behaviour begins for their next hit (24 hour Sobey’s to the rescue). Just another reason to reach for the veggie sticks over anything that comes in a bag or box at your next party! Sticking to a regular, healthy eating schedule during the summer months is not easy. BBQ’s, ice cream, campfire treats, chips, and booze are plentiful whether at the cottage or a backyard party. There is nothing wrong with treating yourself every once and awhile, but given the plethora of special occasions over the summer (weddings, parties, vacations etc) it can be unwise to use every event as an ‘excuse’ for going overboard. Below are some healthier Summer Eats & Treats you can make and indulge in from the comfort of your home. Ice cream is by far one of my favourite foods. When I lived in Italy for a year, gelato was a daily staple in my diet. Unfortunately, most conventional ice creams bother my gut due to their combination of dairy, sugar and some scary sounding food additives (mono and diglycerides, corn syrup, soy lethicin, tartrazine and polysorbate 80). Instead, I use the ice cream maker attachment for my Kitchen Aid stand mixer to create instant and delicious ice cream at home. This ice cream was made using a combination of this Paleo Chocolate Ice Cream Recipe , topped with peanut butter fudge chunks from Chocolate Covered Katie. 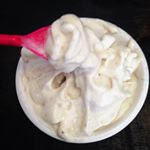 The only issue with homemade ice cream is that is does not freeze well over time and is best served immediately after making for a creamy, authentic texture. Last by not least, my ultimate favourite frozen dessert item this summer was these gluten-free and dairy-free key lime pie ‘cheesebake’ bars from the Everyday Detox Cookbook by Megan Gilmore. The recipe originally called for lemon, but I replaced it with lime for a more tart and refreshing taste. Her cookbook contains excellent recipes without complicated or hard to find ingredients. I ordered her cookbook on Amazon. Summer might be coming to an end, but you still have plenty of time to experiment with these recipes in your own kitchen! Why are the Japanese so Slim??? Arriving home from Asia, one of the most common phrases I heard was 'They are all so skinny over there'. Having now visited Japan, I see how a culture of healthy living, excellent public transportation, and food quality over quantity leads to some of the lowest obesity rates around the globe. I don't think its simply good genes that make this possible, but several lifestyle and cultural choices that lead to slimmer waistlines. Below I have shared some of the secrets to maintaining a healthy weight, while improving your overall food experience and finding more pleasure in what you eat everyday. One thing I noticed each timed I dined out in Tokyo was the lack of leftovers or to-go boxes in restaurants. Instead of massive portions, meals were perfectly portioned to leave diners feeling full and satisfied. In addition, the culture of Supersizing here in North America was virtually non-existent and to an extend, shamed upon. I visited several Starbucks (mostly for free Wifi and clean bathrooms since a regular black coffee cost $3) and was amazed at how small the drink were. In Tokyo, the prices for drinks are clearly marked at short, tall grande and venti. You can order a short coffee back home, but its not listed on their display because it not common. In Tokyo, everyone orders short or tall drinks, sitting leisurely while enjoying their creations! I only saw one person with a grande and it was a plain green tea! One of my biggest pet peeves is cell phones at the table, I HATE when I am out with a group of people or date night and the cell phones start to get pulled out, it makes me feel extremely unappreciated and unimportant. In Tokyo, meal time is a chance to catch up with friends, or if dining alone, a time to sit back, relax and savour all the delicious fresh food. Trust me, I looked long and hard, and I never once saw anyone pull out their phone in a restaurant. Furthermore, they don't stand'n'stuff. Even when people buy street food, they will sit in the market, beer or sake in hand, and enjoy their food with friends. I never saw anyone rushing around stuffing fastfood into their face. Since eating and drinking is strictly forbidden on the subway, I also saw no mindless eating when commuting to and from work. A Japanese Minivan is a Mom on a bike with a baby on her chest, a toddler in the front basket and a child in the seat strapped to the back. Although I saw very few gyms in Tokyo, I saw very few inactive people. Everyone walks, bikes or stands on the subway as a means for transportation. In Tokyo, the sidewalks are very wide and pedestrians and bikes travel along side by side, safe from the cars on the road. This means loading up the family on the bike and pedalling hard to get you and your family from A to Z. If you take the subway to work, it likely means walking 10 minutes to a stop, standing for an hour on the subway (there are very very few seats, I never got one once! ), transferring between lines at a station and then walking to work. Their subway stations are massive, changing from one line to another can mean walking almost a kilometre underground and climbing several flights of stairs to reach your train. I almost never buy iced tea in Canada because the first two ingredients are often sugar and water, with actual tea coming in somewhere near the end. In Tokyo, I saw people everywhere drinking of bottles of green tea everywhere from their infamous and ubiquitous vending machines. I was hesitant to buy any because I hate sugar in my tea and I had no idea what I was buying since the ingredients were listed in Japanese. Finally, I convinced myself it can't be that bad and was pleasantly surprised to find out that every brand I tried was nothing more than 100% green tea and water. This made for a delicious and refreshing treat every afternoon in the hot sun. When you go for lunch or dinner to a restaurant, it is also customary to serve your green tea alongside your meal. Green tea has several health benefits, and drinking several cups a day has been proven to assist with weight loss. I miss my daily fix of green tea, and I am still searching for a bottle of green tea in Canada that doesn't contain processed sugar and preservatives. All in all, I really enjoyed my time in Asia, the people, scenery, food and transportation systems are all top notch. It's very sad to think about how much better Toronto could be if we had built a more robust subway system and safer bike lanes around the city. Now back home, I am trying to keep up with some of my healthy habits from the Japanese. I remove my phone from the dining table when eating, am trying to bike as much as possible not that summer has arrived, and I am making big batches of tea in the evening and letting sit overnight in my fridge so I had iced tea ready to go the next day. When eating out, I remind myself of our gigantic portions sizes here in North America and try to only eat until almost full, then ask the server to bring me a box and take the rest home for later. Below is a picture of selections from the 'Japanese' section of the breakfast buffet at my hotel. (American section was white bread and butter, corn flakes, milk and orange juice). I opted instead for iced and hot unsweetened green tea, salad, miso soup, veggies and grilled salmon, not a bad way to start off your day! Looking back, I’ve done some pretty insane things in my life (bungee jumping in Nepal, skydiving in Australia), but this past Sunday tops it all. I thought it would be a GOOD idea to go shopping at Costco on Sunday morning of the Super Bowl. Stupid huh? It took almost 20 minutes to find a parking spot, which meant parking at the farthest end of the lot possible, lugging my groceries in -18 degree weather and waiting in the most ridiculous line for the women’s bathroom. I spent the entire time living in panic that I was going to get into an accident given the ‘road rage’ I experienced both in the car and inside with peoples’ shopping carts. Although Costco had some amazing looking samples out, I barely got to try anything as it was full on food wars with people pushing and lining up to try all the Super Bowl treats, you should’ve seen the line-up for Krispy Kreme! Luckily for me, the stuff I was buying no one else was looking to buy, sparing me from fighting over packages of chips and popcorn, and leaving with probably the healthiest grocery cart in the entire building. This was my first time to the Costco in Etobicoke and was pleasantly surprised with the quality, quantity and variety of food items stocked. Apart from a massive stock piling of veggies (I’ll be eating organic baby carrots for weeks), I found some amazing food items that make my new membership worth every penny. 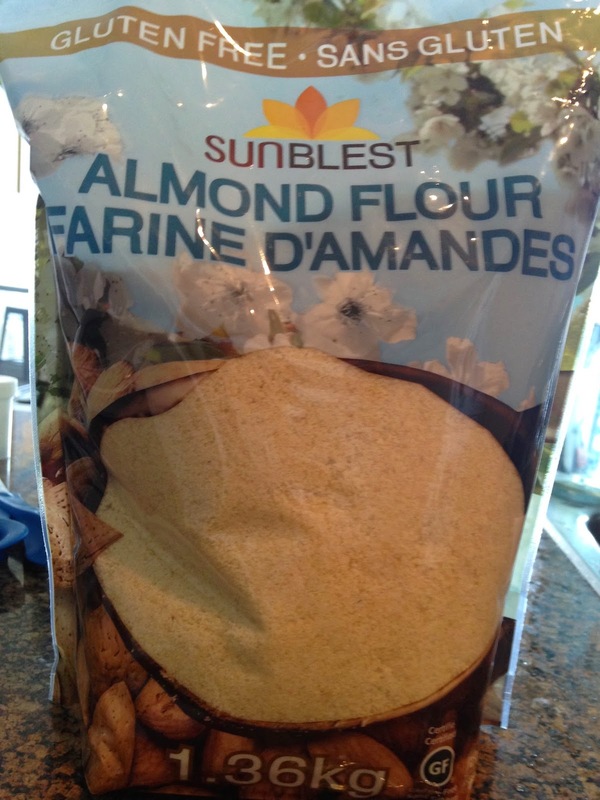 The first thing that spotted my eye was this giant 1.36kg bag of almond flour. I love baking banana bread and carrot cake with almond flour, and this bag was a good price given how expensive almond flour is at the grocery store. I will have to report back once I’ve tested this brand in recipes. 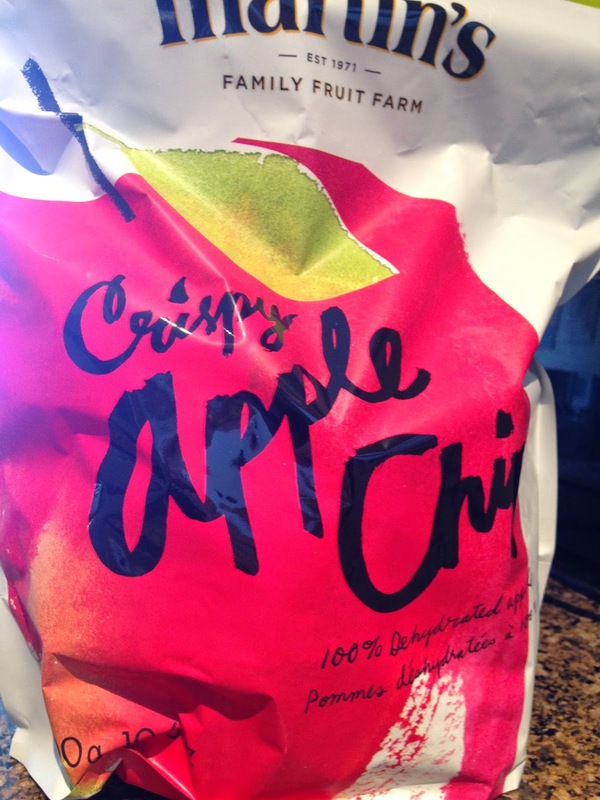 Next, I found these yummy and healthy apple chips. With only one ingredients (apples), these crunchy sweet apple chips will satisfy your chip and sweet tooth all at once. In the meat department, I stumbled across a three pack of organic lean ground beef, which was a very reasonably priced. I used one pack to make taco salad today and you can totally tell the difference in taste and texture from regular beef, absolutely delicious! Last, I’ve been making more soups and stews to keep me nourished and warm during this cold winter months. 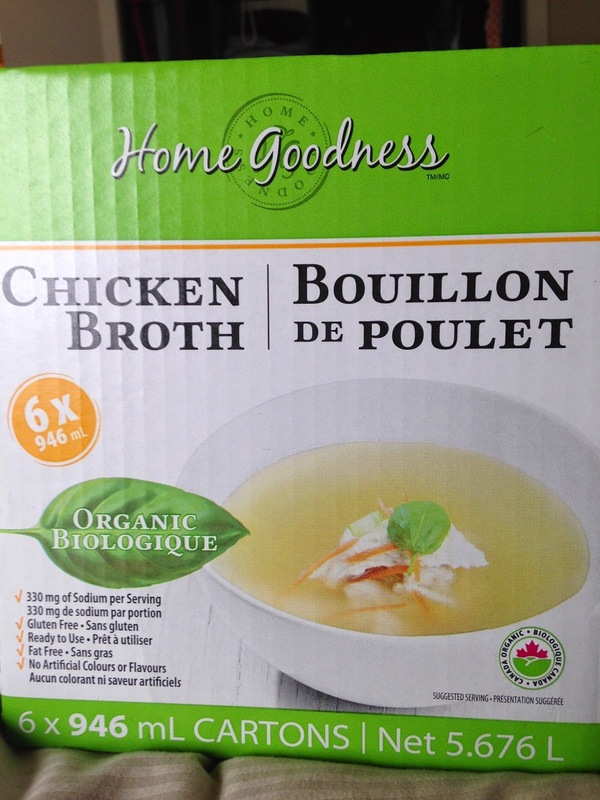 This 6 pack of organic chicken broth made with real ingredients and no added colours, flavours or preservatives was a steal compared to the price you pay for one pack at Whole Foods. Like I said, I don’t think any of these items were bought by anyone else but me on Sunday, but hey, I love filling my fridge with real, healthy food and will save me a ton of time and money in the long run! What did I not purchase and plan on trying next time? I somehow managed to miss the egg section and look forward to trying some of Costco’s free-run eggs. Other items on my wish list include: the giant bag of Prana Kilimanjaro mix, two pack of whole organic chickens, and a new brand of gluten-free crackers since all the brands I’ve tried have been delicious so far. December Superfood of the Month is……..Medjool Dates! As a student, the holidays aren’t all merry and bright. Until December 20th they are a dark, gloomy, terrifying and frenzied mess, with 8 final exams including two practicals (an OSCE and acupuncture) I find it hard to sit back and relax this time of year. Nonetheless, I have been busy attending several Christmas parties with wonderful family and friends, where the food and drink have been delicious and plenty. One of my favourite items to incorporate in party appetizers and desserts this time of year is medjool dates. Crowned the “King of Dates”, these sweet, simple dried fruits are extremely versatile. I’ve found myself craving sweets more than usual lately with all the exam stress, a classic pattern of Spleen Qi Deficiency in Asian Medicine. Instead of reaching for sugary processed treats, I prefer to make my own homemade treats containing natural sugar and real ingredients to satisfy this sweet tooth. So what makes Dates a Superfood anyways? 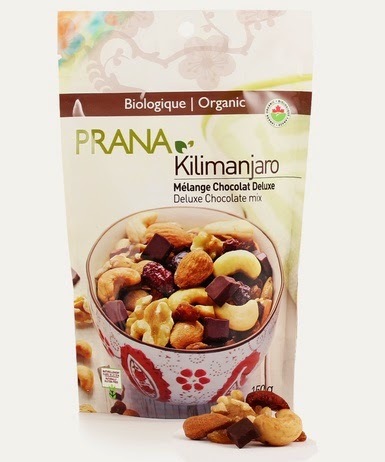 Naturally sweet, this high-energy snack is a good source of potassium, manganese, copper and magnesium. Dates are filled with fiber, promoting regular bowel movements; this is why they are often touted as a natural prescription for constipation. They can be used in several recipes as a substitute for refined sugars, and also have a distinct flavor that makes a great vegan or paleo substitute for caramel sauce. Interestingly enough, when I was researching the health benefits of dates for this post, I came across a research article that pointed out the benefits of eating dates during the last 4 weeks of pregnancy to reduce the need for induction and augmentation of labour! Two of my favourite party dishes using dates are listed below. 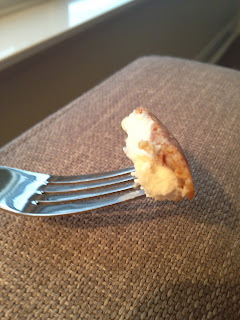 The first is a super simple and crowd-pleasing appetizer. I can’t take any merit for this idea, they simply had samples out of it at Sobey’s one day, which I happily chewed down on. The second recipe I created while procrastinating when studying for my last exams. They were a huge hits in our household and something I looked forward to enjoying as exam treats all week! Note: If you are following a low FODMAP diet for gastrointestinal concerns, dates, like other dried fruits, are considered at high FODMAPS and should be avoided. 1. Remove pits from dates, I find it easiest to squeeze the date slightly and then pull the pit out from one end. 3. Shove into mouth and enjoy! 2. 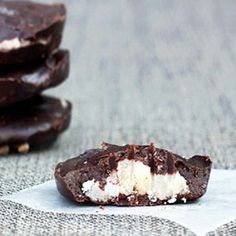 Melt chocolate in microwave, stirring every 30-45 seconds. 3. Pour melted chocolate over top of date nut mixture, and sprinkle with sea salt. Freeze until solid. 4. Store in freezer and remove 10 minutes before serving. Do you have a favourite holiday dish? I love the sweet potato casserole my mom makes with pecans, cranberries, pineapple and carrots, it a nice GF and allergy friendly substitute for stuffing. I have a dirty secret. I am obsessed with looking at other people's shopping carts at the grocery check-out. 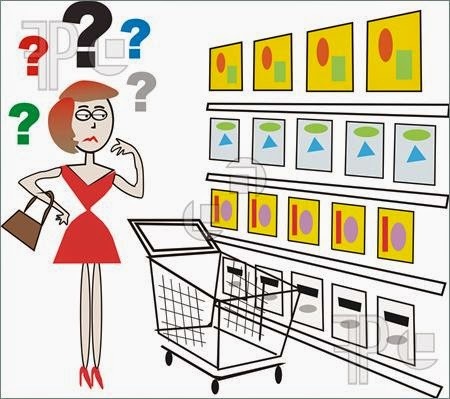 I find it absolutely fascinating to see what people buy, or don’t buy for that matter, when shopping for food. I honestly believe some people have no idea what they are buying, and what damage this ‘food’ is doing to their bodies. To help demystify the shopping process and give you a snapshot of my shopping experience, below if a list of foods I bought at Fiesta Farms this weekend. One of my favourite grocery stores in Toronot, this independent store has a huge selection of organic and non-organic produce, and also stocks several specialty items. Think of it like the No Frills of Whole Foods, and parking is free! This will give you a quick run down of what I tend to buy on a weekly basis and what some of my staples are. So what did I do with all this food? For a yummy and high energy treat, I made some fig cacao protein fudge using the following recipe and a warming butternut squash and pear soup, perfect for a chilly Toronto day! The pear adds a touch of sweetness, allowing this recipes to be made without any processed sugars. 2. Peel and cut squash into 1 inch cubes. Place squash and onion halves on baking sheet and drizzle with olive oil and sea salt. Roast in preheated oven until very soft, about 25-30 minutes, tossing halfway through. Let cool. 3. Heat olive oil in a large soup pot over medium heat. Stir in the garlic, ginger and curry powder cooking for a few minutes. Add stock and bring to a boil. Stir in the pear(s) and the squash and onions, and simmer until pears are very soft, about 30 minutes. Stir in coconut milk. 4. Pour the soup into a a high-powered blender (read: Vita-mix) and carefully blend in small batches until smooth-the blender shouldn’t be more than half way full for each batch. Top with cilantro and enjoy!